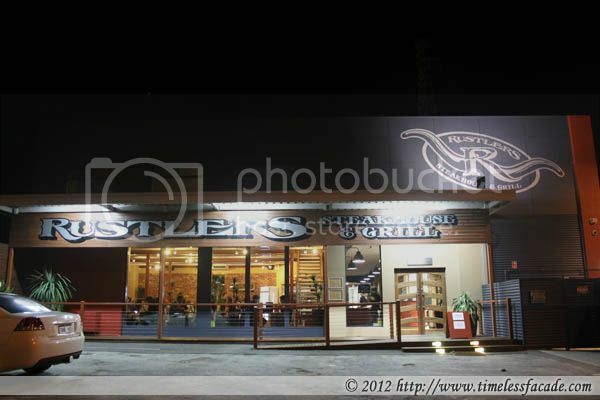 It was our last evening in Albany and being the lazybones that we were, we opted to have dinner at Rustler's Steakhouse, a mere 5 minute away walk from our lovely apartment. 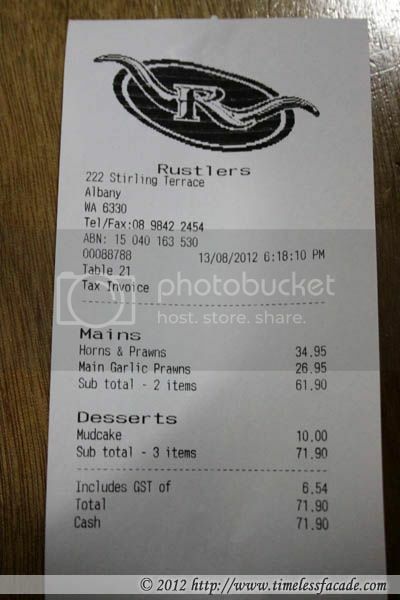 It definitely helped that Rustler's was rated as one of the best restaurants in Albany. The interior honestly didn't look like much. 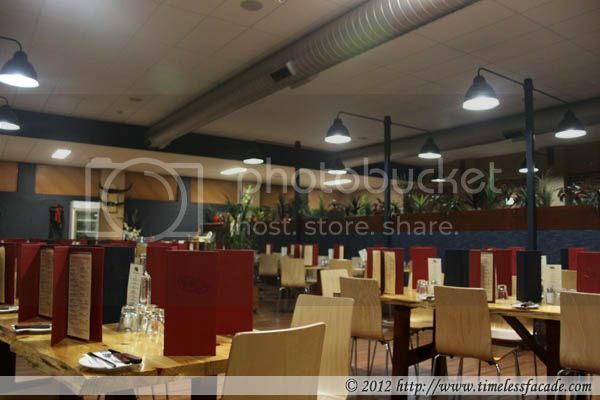 Just a big room with wooden tables and chairs and some make do decor. The place had a somewhat strange warehouse/mass market vibe to it - definitely not great for dates. Honestly, this dish looked a little underwhelming with a mountain of salad served alongside a small potful of prawns. To be fair, the prawns were fresh but weren't exactly sizable and were swimming in some sort of garlic "soup". It would probably have tasted better if the "soup" had been a little less runny. I've got to give it to Rustler's for the thorough cleansing of the prawns though, something which alot of Singapore restaurants fail to achieve. 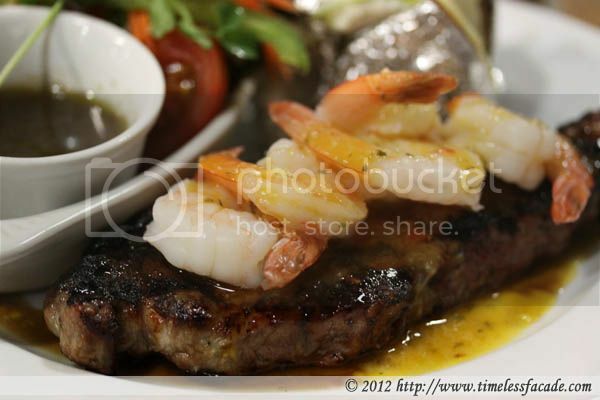 9 oz porterhouse coupled with sweet chilli butter prawns, offering the best of both worlds. However, I couldn't quite make out the sweet chilli butter but at least the prawns were fresh. The real star of this dish was undoubtedly the steak, which came a perfect medium as per my request. Flavourful and juicy with bits of fat and char grilled to perfection with nice crispy bits along the edges. Excellent! Apparently the dessert changes from time to time so it would be good to check with the wait staff what's available. And we were recommended the banana mud cake, which on hindsight, was an excellent choice. 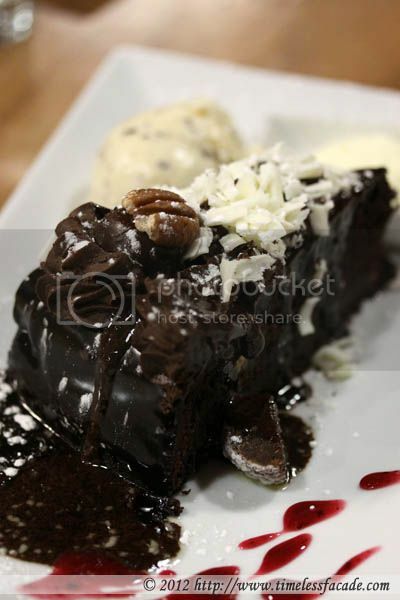 Moist and light yet rich in chocolatey goodness without coming across as overly sweet. The accompanying ice cream didn't taste like anything out of the ordinary though. The cake is huge so best shared amongst two. 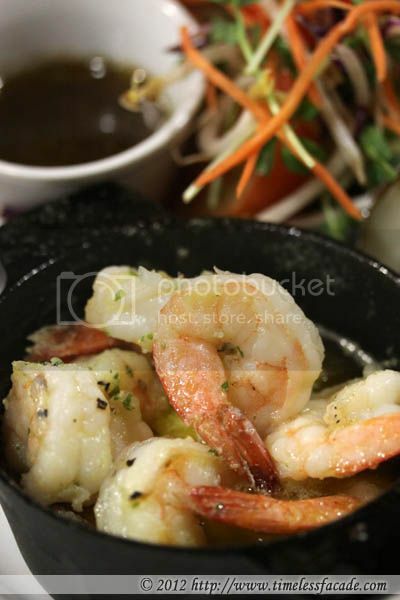 Overall, the meal was quite enjoyable save for the prawns and service was great. It didn't cost us an arm or a leg either, coming in at about AUD 72 (SGD 93). The place was quite crowded on a Monday evening so be sure to make your reservations if you would like to sit out in the front portion of the restaurant. Opening Hours: Open for dinner daily. Congrats! 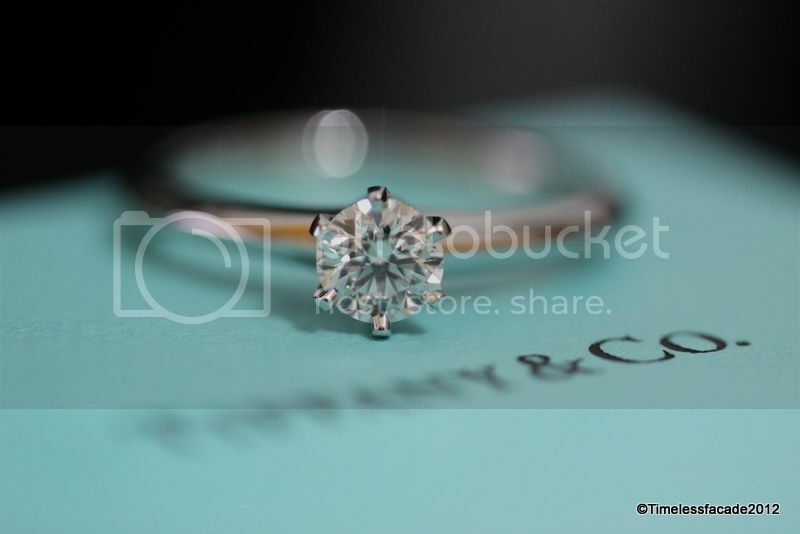 Enjoy your blog very much. Keep it up. Appreciate the putting up of receipt which few bloggers put up.